Artist Mirko Basaldella (1910-1969) created this sculpture which is cast, welded, and chased in bronze. 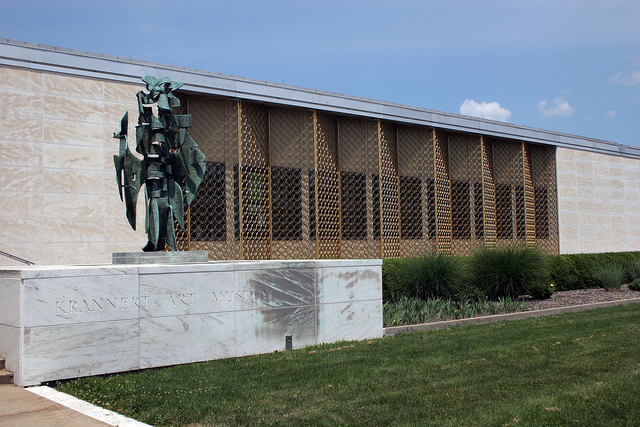 The ten-foot-high sculpture is displayed at the south entrance of the Krannert Art Museum. It was acquired in 1961 through Ellnora D. and Herman C.
Initiation, a powerful ten-foot-tall bronze constructed of planar and ribbon shapes, varied hollow spaces and rhythmic curved edges, while nonrepresentational, still suggests in proportion and stance a totemic human figure at once guarding and beckoning. A timeless quality also pervades the sculpture, marked and scratched as it is with a multitude of magical hieroglyphs of no known culture, although stylistically it bears dose affinities to Chinese Bronze Age artifacts. Positioned in front of the block-like, horizontal white marble original section of the Krannert Art Museum, it contrasts pleasingly in color, scale, and spirit. The artist wrote that the piece "related to the character of the museum, a university museum where the young may be initiated into an understanding of the different aspects of human activity. But I have not made a realistic interpretation of Initiation," he explained, "but rather an allusion to a personage who is both teacher and repository of all human knowledge, and solemn as are initiation rites.... The recurring motif of fullness and emptiness suggests the passing of knowledge from the initiated to the initiate and may be likened to ocean waves which are perpetually alternating and becoming.... The textural decoration on all surfaces of the work suggests a mysterious and ancient scripture to be revealed to the initiate." Mirko - he used only his first name professionally-studied in Venice, Florence, Rome, and Monza, won many prizes, and participated in special exhibitions of his sculpture. His public monuments include the bronze Fosse Ardeatina Memorial Gates in Rome, which commemorate the reprisal murder of 320 Italians by the Germans in 1944; the Italian War Memorial at Mauthausen Concentration Camp, located not far from Vienna; and the Piazza Benedetto Brin Mosaic Fountain at La Spezia. Muriel Scheinman, “Initiation, 1961,” ExploreCU, accessed April 21, 2019, https://explorecu.org/items/show/2.